There are plenty of people, who know guns in deep detail, including hunters, rec shooters, and of course, law enforcement officers. 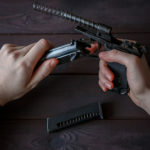 For those that are just starting off, or need a refresher to get back on track, we have below a look at the basic firearm parts in pistols, rifles, and shotguns. 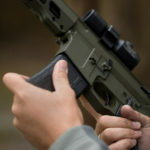 It goes without saying that you should keep an eye out for changes to the gun laws in your state and county; official information regarding this can be found online. Also important is taking a gun safety course if you think you may be a bit rusty, as well as buying a few assistive weapon accessories. Modern and older handguns comprise four main parts: the action, the frame, a cylinder or a clip, and the barrel. 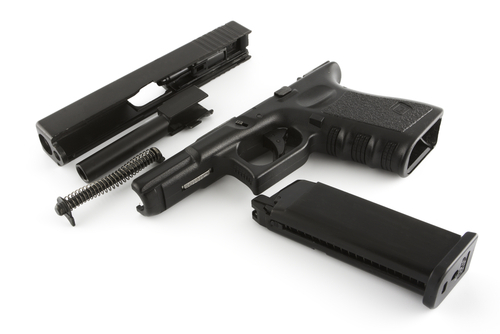 The Action: This part contains components, which fire the cartridges, including the trigger. The Frame: This forms the metal housing, including the grip of the weapon. Every part of the gun is either fixed inside or on the frame. The Barrel: This metal tube sticks out of the frame of the gun, and serves as the portion through which bullet travels when leaving the gun. Cylinders and Clips: These are not the same thing. In a revolver, you would have a cylinder holding the ammunition, whereas in a repeating handgun, a clip or magazine is used, that fits inside the grip of the firearm. Handguns also have other basic parts such as the magazine release, front and rear sights, muzzle, slide stop, trigger guard, and trigger. A rifle’s main parts include the action, the stock, and the barrel. The Action: This component is responsible for loading the ammunition, firing it, and then unloading spent cartridges. The common actions of a rifle include lever-action, bolt-action, semi-automatic action, pump-action, and break action. The Stock: This part of the rifle is what you grab and hold in order to aim the firearm. The Barrel: This is the elongated metal tube protruding outward, and the part through which the bullet travels when leaving the gun. A rifle’s other basic parts include the rear and front sights, bolt, receiver, trigger guard, trigger, safety, and magazine. Basic shotgun parts comprise the following: the stock, the action, and the barrel. The Stock: This is the portion of the shotgun, which you hold in your hand, as well as the one, which you rest against your shoulder. The Action: This portion loads ammunition, fires it, and then discards the spent shells. 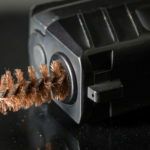 The Barrel: This part protrudes outward from the firearm, and is shaped as a tube, which the pellets navigate while leaving the gun. A shotgun’s other basic parts include the receiver, ejection port, breech bolt, magazine cap, muzzle, safety mechanism, and trigger guard. Treat Every Gun like it is Loaded: This is a sound and safe practice when you come in contact with any firearm. Unless you have checked and made sure there is no ammunition inside, trust no one’s word on the matter. Any gun you take in hand automatically becomes your responsibility, in that if it goes off and causes damage or injury, you are to blame. If the workings of a gun are foreign to you, then leave it alone. Never Point a Gun at Something you Would Not Willingly Shoot: Always watch the direction in which a gun is pointed, and make sure the firing end is not facing an object or person you want staying intact. This rule saves lives, so follow it with full heart. Due caution is a must when handling any firearm, no matter who it belongs to. 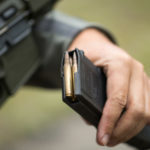 Keep your Finger Off the Trigger Guard and Trigger: Until you have your sights set on a target, it is imperative that you hold your fingers off the trigger, and outside the trigger guard. There is no point in touching either part unless you have made a clear decision to shoot. If your finger happens to be at one of these spots and something startles you, the most likely outcome is your body tensing, and an accidental shot going off. Know Where your Target is, and What Surrounds it: Again, holding a gun makes you responsible for it, and if it fires, that is your responsibility as well. Be aware of where your shot would hit, as well as any surrounding targets that could take damage if you miss. You would also need to be able to correctly calculate whether the shot will pass beyond the target after penetrating it, and if it will have enough power left to kill or hurt someone.